In the terms of the 500 year lease for what would become the People’s Park, The Earl of Limerick stipulated that no political or religious meetings would be allowed in the park and no bands would be allowed to play on Sundays. Clay pipes were produced in the 19th century in Merrit’s factory, Broad Street. Twice a year fifty tons of clay would be imported from Liverpool for the process. 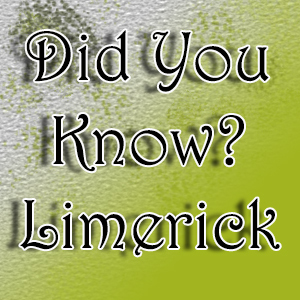 In 1911 Limerick had, 2 Telephone Operators (both women), 1 Telephone Worker, 1 Telephone Wireman and 2 National Telephone Inspectors. Chalk Sunday derives it’s name from the old custom of children putting chalk marks on bachelors on the first Sunday of Lent. Clampett’s Bow (a narrow lane off John Street) was the scene of a minor siege as a result of a chalking incident on Chalk Sunday 1879. The A1 Bar on Clare Street was once an R.I.C. Barracks. That in 1796, there were 171 recorded flax growers in Limerick. Flax was used for both food and clothing. The fountain in front of St. John’s Cathedral was erected in 1865, iron goblets were attached to 2 spouts to enable the public to drink and fill small containers, while larger containers were filled at the other 2 spouts. In 1850,there were 680 inmates sleeping in the loft of the Clare Street Convent. On 29 January a little after 8pm a false fire alarm was called and these 680 women tried to escape through the one narrow stairwell but fell onto each other. 27 women were killed but only 19 of those could be identified. In 1769 Dr. Anderson brought Scots Pills to Limerick, these claimed to be a remedy for “Disease, or Pains in the Head, or Stomach, of man, women and children; but especially against Giddiness, or Megrims, Weak or Blear’d eyes, Want of Appetite, Choler, Melancholy, Phlegm, Gross and Thick Humours, Worms, Paleness, Greensickness, Defluxions on the Lungs or Joints, Rheumatism, Gout, Gravel, Stone, Scurvy, Dropsy, Colick or Gripes and all Obstructions” these magic pills could be yours for 1s 7d. In 1911 Limerick had 5 Piano Tuners, John Vokes, George Holland, John Brigman, James Kavanagh and Robert Thompson. The seats in the Peter’s Cell Theatre in 1760 cost 15p for boxes, 10p for the pits and 5p for the gallery.